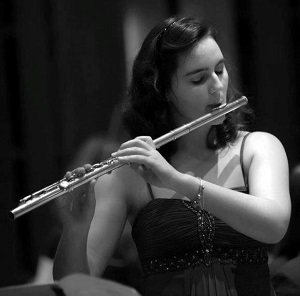 Mafalda Carvalho is a Portuguese flutist, born in Troviscal on July 11, 1991. She is currently the Principal Flute of Orquestra Clássica da Madeira and also a flute teacher. Mafalda has a Masters Degree in Music Education from Aveiro University, where she studied with Jorge Salgado Correia and a Masters Degree in Music Performance from Oporto’s Escola Superior de Música, Artes e Espetáculo, where she studied with Raquel Lima. Previous studies include a Bachelors degree at ESMAE. She began her musical studies at the União Filarmónica do Troviscal’s Music School at the age of six. In 2000 she was admitted to the Conservatório de Música de Aveiro Calouste Gulbenkian, where she studied under Florbela Gonçalves, José Abreu and Ana Maria Ribeiro, finishing her High School studies with the highest grade. She has participated in Flute masterclasses with Paulo Barros, Marc Grawels, Fernando Raña, Claudia Walker, Joan Ibañez Briz, Lisa Nelsen, Cristina Anchel, Berten d’Hollander, Christine Beard, Mario Caroli, Maxence Larrieu, Wendela van Swol, Michel Bellavance among others. She has been a member of: Orquestra de Jovens de Portugal – Momentum Perpetuum, Orquestra de Jovens dos Conservatórios Oficiais de Música, Orquestra de Jovens da Sinfónica da Galiza and the Estágio Gulbenkian para Orquestra. On the contemporary music field she has attended the I Remix Ensemble Summer Academy and was a member of the Oporto Contemporary Ensemble. Mafalda Carvalho has been awarded a large number of prizes, such as the 1st Prize at Prémio Jovens Músicos – senior level (2016), 2nd Prize at Prémio de Interpretação Frederico de Freitas – Universidade de Aveiro (2016), 1st Prize at Concurso Internacional Terras de La–Salette (2013), 2nd Prize at Concurso Internacional Terras de La–Salette (2012), Honorable Mention at Prémio Helena Sá e Costa (2011), 1st Prize at Concurso Albertino Lucas – Fafe (2010), 3rd Prize at Prémio Jovens Músicos – senior level (2010), 1st Prize at Concurso Paços Premium (2010), 1st Prize at Concurso Internacional Terras de La-Salette (2010) and the David Russel Honorific Prize for young talents in Vigo, Spain (2008). Mafalda won a prize by RotaryClub Veloso & Troca, Lda. for being one of the three best students at ESMAE in the school year of 2011/2012, and has also earned several prizes with her chamber music groups. As a Flute teacher, she was on the faculty at União Filarmónica do Troviscal’s Music School, Academia de Música de Paços de Brandão, Escola Profissional de Arte de Mirandela and Escola de Música de Perosinho. Mafalda’s orchestral career includes collaborations with Fundação Orquestra Estúdio – Guimarães 2012 (European Capital of Culture), Orquestra Filarmonia das Beiras, Orquestra Clássica da Madeira, Orquestra Gulbenkian and Orquestra Sinfónica da Galiza (with whom she went on tour to Abu Dhabi, in January of 2016) working with Jan van der Roost, José Pascual Vilaplana, Miguel Sanz Madrid, Eugene Corporon, António Saiote, Pedro Neves, Joana Carneiro, James Ross, Alberto Zedda, Magnus Lindberg, Susanna Mälkki, Martin Andre, Andrés Salado, Dima Slobodeniouk among others. As a soloist, she has played with Orquestra Clássica da Madeira, Orquestra Sinfonieta da ESMAE, Orquestra Metropolitana de Lisboa and Orquestra Gulbenkian. Mafalda is a member of Trio Densité (flute, clarinet and piano), Trio Cadenza (flute, cello and piano) and Éolia Flute Ensemble. If you are interested in working with Mafalda, please get in touch with the EMCY Office.